A few months ago, I was thrifting at a secondhand store out of town. I love scouring thrift stores for their sewing patterns – they’re a goldmine! Anyway, I stumbled on this cute pattern Simplicity 4836. It’s a little boys’ pants, vest and jacket suit pattern from the early 1960s. I originally bought it to put it in my shop, but on closer inspection I noticed something amazing. Simplicity 4836 – you’ll make one little boy so stylish! The original owner had scribbled some notes on the front (as sewists often do!) and made it for a little Michael in 1965. What were the chances – I have a little Michael in my life! At two and a half years old, my nephew is a big strong boy, so I figured child size 4 might be on the big side, but it would make sure there’s growing room. I just couldn’t resist. I set out to make the vest as it’s the most versatile. I had some leftover navy blue wool/poly twill from a skirt, and enough lining for the project. It was such a quick sew and great use of those awkward leftovers that are “too big to give away but too small to make something”. Based on this logic, I think I’ll be making many, many more things for my nephews! Kid – you look good! 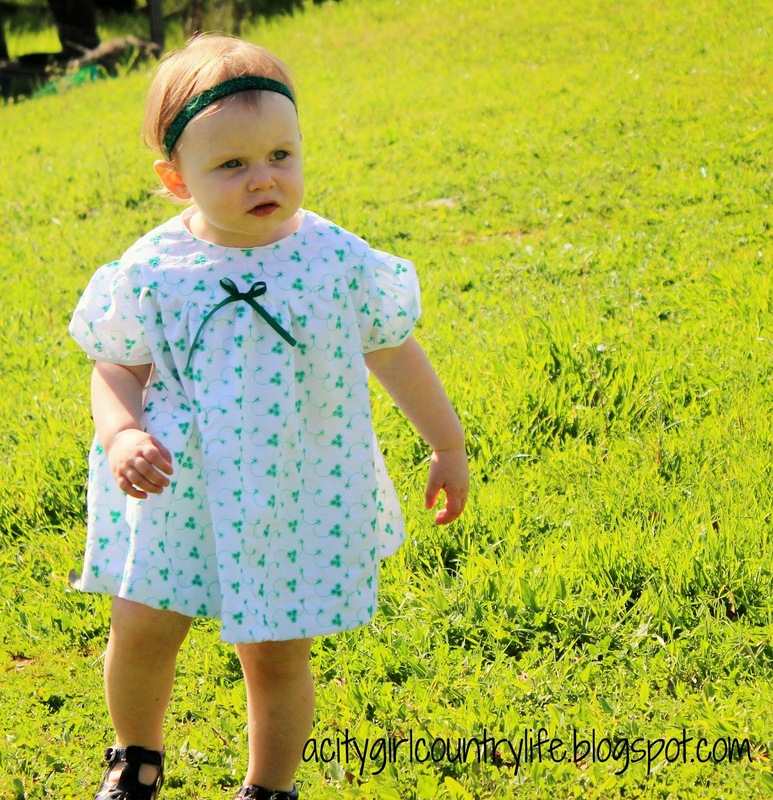 Excited to share the dress I made for my youngest, little one this past spring. 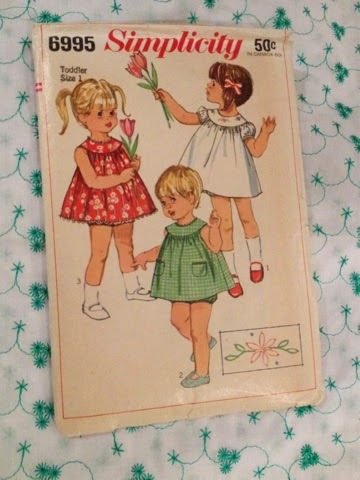 The Simplicity 6995 girl’s dress pattern has been sitting in my stash for a while. When I found the cotton eyelet fabric, I knew I had to give it a try. This pattern (Simplicity 6995) was super fun because I am sucker for anything vintage, especially fashion!!!! I have wonderful memories of my mom making costumes for us as kids and I have carried on the tradition. As we approach the Halloween season, I thought I’d share some of my all time fave sewing projects starting with one of my favorite classic movies: The Wizard of OZ! Of course, wearing vintage on a regular basis, I play dress-up more than most. As my children get older they have taken charge of their dressing up and their costumes have become less elaborate, so they don’t need mom’s help. I thought I would share some of my favorite Halloween Homemade Costumes. The above picture is my two kids and my friend’s daughter (Dorothy’s costume was store bought). This was one of my favorite years. We had agreed to go with a Wizard of Oz theme, which may not be original in itself, but how many flying monkeys have you seen? I’m not sure why it thrilled me that my daughter wanted to be the wicked witch, but it was fun to make her costume and the fact that she thought outside the box not wanting to be Dorothy or Glenda filled me with glee. The Flying Monkey, was a horse of another color. At the time there were NO patterns for flying monkey costumes. Perhaps there are now, but when I made his costume I used a standard one-piece body suit (like the Butterick pattern) which I made in furry gray fabric. The jacket was pure fabrication. This was BEFORE DVDs were popular and we had The Wizard of Oz on video. I paused, and rewound and paused and rewound and hand drew the monkey jacket design. And talk about a pain in the emerald city, all the piping was crazy to sew. Of course I could have painted it on or done something less elaborate, but my mother’s voice is forever in my head telling me to do it right. A couple years later I convinced my husband to do a couples costume and hoodwinked him to be one of the guys from the Brush and Wash from Wizard of Oz (you know the part where they’re in Emerald City and getting spruced up to see the Wizard). I had always loved the color green and the cute 40’s gals who did the hair trim! I fabricated my husbands hat and my collar and sleeve cuffs. I used a 1940s pattern for the dress body, but fit it a tiny bit long in the waist for me. Although it still worked, it scrunched up a tiny bit at the waist. It was amazing to swing dance in though! Do you have a favorite Halloween costume you’ve made? This is the bodice of the dress that I have made for my three year old god-daughter. In real life the dress is finished apart from a tiny bit of hand stitching to neaten off a few details on the inside. However in blogland it is still a work in progress because I have been showing the construction step by step to demonstrate the dressmaking techniques I use. Because I only use straight stitch machines – hand machines and treadles – zigzagging and overlocking is a mystery to me. I didn’t know what an overlocker looked like until I watched the Great British Sewing Bee recently, and I had been reading American blogs for ages before I worked out that sergers were what we call overlockers. Today I have put a post on my blog, lavishly illustrated with 18 photos, showing how I do bound armhole seams. Previous posts include photos of how I have drafted the pattern piece for the collar and done the felled seams. I hope my posts are helpful to keen retro fans. There is still a way to go before I have posted all the stages of construction. 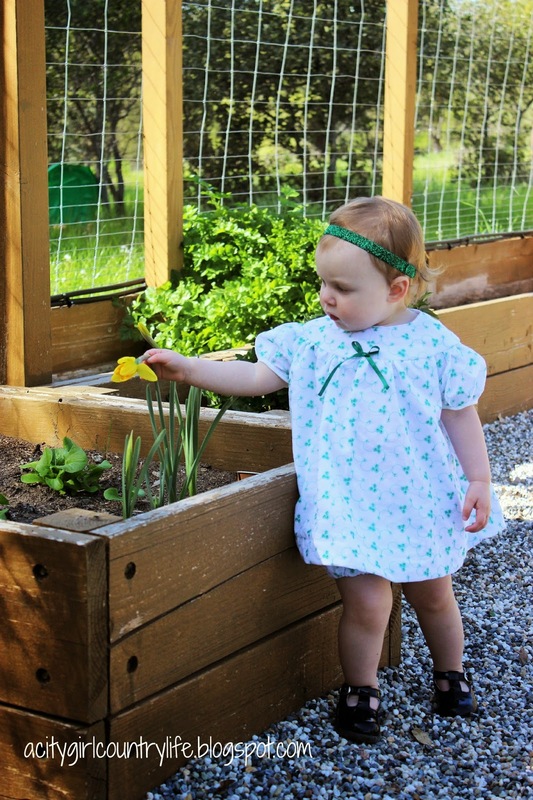 I sewed up an Easter dress of my daughter’s choosing from 1940s Simplicity 1573 pattern for girls in size 6. I modified it slightly, but it’s mostly true to the pattern. It’s also another projects for Sew for Victory 2.0, and I’m hoping I’ll have more projects completed before the deadline. While the fabric pattern is completely modern, the idea is definitely vintage and 1940s. Read and see more about it on my blog. They were so easy to sew up and I already have plans for a few more shirts for them.